Haldex Concentric has opened a new 40,000 sq. ft. extension to its factory in Pune, India where it manufactures and assembles oil and water pumps for medium and heavy diesel engines. The extension was commissioned to meet the fast growing demand for Concentric pumps both in India and in export markets. Since the present, purpose-built plant was opened early in 2005, capacity has doubled to over 2 million pumps per annum and India has progressed to become the global centre of excellence for water pumps within the Haldex group. 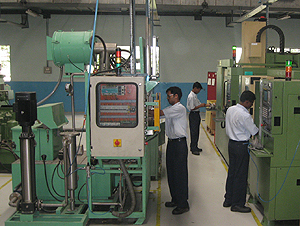 The Pune facility incorporates ten assembly lines equipped with interlocked PLC-controlled stations to ensure no-fault forwarding and torque-to-turn technology for precise torque control. The machines are all high-speed with PCD tooling and equipped to support quick changes in set-up. Equipment includes air leak testing units, part presence and loading error sensors, lasers to detect o-rings and circlips and rejection chutes for quality control. The extension project was completed in only six months and incorporates a number of environmental features, including storm water harvesting at the site to enable recycling for the purpose of irrigation. In addition there is an effluent and waste water treatment facility and tree cover has been extended with 25,000 sq. ft. of planting to provide shade. The building itself uses skylights for natural illumination, while air conditioning and insulation ensure a temperature difference of 3 to 40C. The extension brings the total area of the Concentric complex, including the administrative block and factory buildings, to approximately 100,000 sq.ft. equipped throughout with a wide range of modern CNC equipment. All assembly and test stations are automated or semi-automated and poke yoked, while the whole plant benefits from a total preventative maintenance and continuous improvement regime. David Woolley, Managing Director of Concentric India, commented: "Since 1999, when we commenced operations in India, our business has grown dynamically in parallel with the huge success of the Indian automotive sector. At the same time, we are particularly proud of the expertise developed by the team, which has made Concentric India a trusted partner of such major Western companies as Volvo and Deutz. This new facility will help us to continue delivering quality equal to anywhere in the world at a price that will be attractive in every market."